It’s almost here! TEDxPennsburgED is finally happening in one week, and we’ll be broadcasting it live to the world (at Upper Perkiomen High School) on May 7th from 12:30-4:30pm (EST). The idea and planning began in the summer for this official TEDx event, but as more and more people are asking, “How did you guys get a TEDx event at Upper Perk?”, I wanted to break down our process into five steps (even though it has felt like 500 steps!). We ultimately decided on the “ED event” as is demonstrated in our name TEDxPennsburgED. We wanted our community, educators in our district (and surrounding districts), and students to come together to learn from experts around the world. Next was brainstorming ideas for a date, potential speakers, and learning about the TEDx rules (there is a lot, but all for good reason). Once this was done it was time to apply. You can apply for a TEDx license here. Reading the rules and understanding the guidelines helps in filling out the application, but I did have to do one revision after filling it out. I choose the TEDx ED license to apply for, but made some mistakes in what the event could be called (we initially wanted to call it TEDxUpperPerk but that was not allowed). As the curator (person applying for the license) you’ll also have to go into detail about your background, why you want to host a TEDx event, and give some explanation about how you plan to pull it off. After re-submitting the application…we waited, and waited, until finally receiving the confirmation email that TEDxPennsburgED had been approved! Then it hit us…uh oh, this is real. What’s next?! The best part about doing a TEDx event at your school or district is how many people are willing to get involved and spend their free time on creating this event! At Upper Perk we sent out a few emails letting everyone know about the event and asking for folks to join the planning committee. I was blow away by the response. We have over 20 teachers, 9 administrators, and 50 students all playing major roles as part of our TEDxPennsburgED planning committee! Our team has grown and multiple people have taken on roles that have brought this event together. I can’t begin to say how proud I am of our team and the work they have done so far! One of the most difficult pieces of any TEDx event is inviting the right speakers and actually getting them to accept the invitation. TEDx rules are specific about not paying speakers, and also not allowing any selling from the stage. Our planning team discussed having a variety of speakers from across the education spectrum, and we were able to create a speaker lineup of a student (a 10th grader at Upper Perk), teacher, principal, professor, college president, associate provost and researcher. Our student Pooja Girwarr was one of 12 students in our district that applied to speak at the event, and after a few rounds of interviews, I’m so happy to have Pooja represent the student body at Upper Perk and the entire community! John Spencer is a teacher in Phoenix, Arizona. John has written several education books, and the popular young adult novel titled “Wendell the World’s Worst Wizard.” John is also the co-founder of technology writing platform, Write About. John is a national speaker on education, creativity, and the power of story. Salome Thomas-El is a Principal in Philadelphia. As a teacher a Vaux Middle School Salome led a group of inner city students to 8-international chess champion titles. He has since written the books “I Choose to Stay” and the “Immortality of Influence” while being featured on CNN and as a regular contributor to the Dr. Oz show. Dr. Edward Clapp is a Harvard University Professor and Senior Research Manager of Harvard’s “Project Zero”. Edward is a leading voice in the design and maker movement around the world, and is an international speaker, who has also written and produced an off-broadway play. Edward is an international speaker on education and design. Dr. Karen Stout is the President of Montgomery Community College and the incoming President of the national organization Achieving the Dream. Dr. Stout has led a national movement to raise up community colleges and fight for the achievement of all students at the post-secondary level. Karen is an international speaker on education and leadership. Pooja Girwarr is a 10th grade student at Upper Perkiomen High School, and has been in the school district since she was in Kindergarten. She has been involved in various organizations throughout her years of schooling at Upper Perkiomen. On her own time, she strives to fundraise money to support research to find cures for childhood cancer. Pooja is very excited to represent the school with her talk, “Becoming That Little Kid, Again”. We discussed as a team what the audience could look like. In the end we settled on 50% of invites sent to folks living and working in the Upper Perk community, and 50% sent out to surrounding districts and areas. We had administrators, teachers, and our area Chamber of Commerce help distribute these invites. Still, we wanted to make sure that anyone who wanted to watch this event could be able to take part in the live experience. To that end, we worked with UPTV (our HS TV studio) and AVT to pull off a live stream for the event. You can now watch TEDxPennsburgED live on the website on May 7th!!! We are still a few days away from the big event. Our teachers, students, and custodial staff have completely revitalized our Courtyard area for a reception after the event. Our teachers and students at the HS have been busy building the set for the stage (it’s so awesome). They’ve made the TEDx letters, signs, and so much more. We have a group of students from our Elementary school showcasing apps and games they’ve made with MIT App Creator and Scratch during the intermission time period, our local Robotics club is putting on a show during intermission, and our MS and HS students are showing the things they are building and making on a daily basis with computers, 3D printers, CNC routers and much more! Our play director and HS English teacher (she’s fantastic) has taken the lead on fleshing out many of the details and I’m so happy to have people invested into this event like her and the many others that are putting their own time, energy, and experience into making this event one to remember! I hope you join us on May 7th at 12:30pm EST to watch TEDxPennsburgED live on the website. I’ll be sure to write a follow-up post about this event, but I’d also love to see some other schools and districts apply for a TEDx event at their school or community. It’s been a lot of work, but it’s also been a lot of fun! However, that was the last year I took “shop” class in high school. I had enjoyed making our C02 cars in middle school, and liked the process of learning in “shop” class…but the food in Home Economics, and the potential game-making in Computer Programming took me away from wood shop. Nonetheless, I continued to create and make long after high school. As a high school teacher I began to see a divide between the kids who took shop class and often went to the local technical school, and those students who took all “academic” classes. This is not to say that they weren’t academic. We had fantastic discussions in English class where high level connections were consistently made, yet many did not see themselves as “academic” and wanted to do other things after high school. In fact, many thought high school was a waste of their time because it had “nothing to do” with where they were headed. I loved the “real world” perspective many of these students brought to my class, but I hated the fact that I categorized them as “those students”…meaning tech school students. The other piece was how the percentages were swayed heavily to boys in both our “shop” classes and technical school. I mean 90%-10% heavy! The flip-side of this equation was a set of students who took every AP and Honors level class they could take during their high school journey. Their goals for high school were different. They wanted to get into a great college, and knew they had to have a HS resume that would reflect how intelligent and hard working they had been for the past four years. They rarely did anything with their hands. Rarely made anything in school that was not tied to a set of standards or written out in paper. This was not to say that they weren’t creative. Far from it. However, their opportunities were limited in “making” because of the academic path they took in high school. Like most things in life, school for me as a teenager, and as a teacher…was not that cut and dry. Most students did not fall into either of the above paths, including myself. I fell somewhere in between, shying away from AP classes and also not seeing the value in tech school. Yet, I always was tinkering around. Making videos (before everyone made videos) and making my own songs, recording things, and always interested in music as I was part of a band. At the time I didn’t know I was a “Maker” or have any idea about that term. I did know that when something interested me I usually jumped at the chance to mess around and play with it to learn. When I gave my students the choice to work on whatever project they wanted to for our 20% Time projects, I joined in the fun. I decided to build my own app from scratch (something I always wanted to do) and the Maker in me came out again. I saw how my students struggled with their projects…yet continued to push through. Even though our projects were not tied to grades, they still cared and had a higher level of commitment than I could have ever drawn out with a quiz or test. This was English class…and we were making things with our hands. We were also writing, reading, speaking, and listening about our own projects and the other students that were in the class. Although my students and I embodied the “maker” mindset during those 45 minutes each week, the problem was simple: That was not enough time. They needed more experiences in school like 20% Time where they could fail safely, learn by tinkering, collaborate freely, and see an idea go from seed to creation over a period of time. Yes, we are 15 years into the “21st Century” and keep talking about it like we’re still not living in this world. We all know how the world has changed, and how our students have changed. Not to mention how the workforce has and will continue to shift towards jobs that are going to require critical thinking, communication, collaboration, and creativity. But I still see many schools as silos. If you want to go to college take this path…and if you want to get “career ready” take this other path over here. That’s not going to cut it anymore. The “career ready” path has to have strong academic merit to it, just as the “college ready” path has to have creativity merit to it for it to actually prepare students for life after school. Shouldn’t a student who is heading to college to take engineering courses have hands on experience designing, making, and building in school? Shouldn’t a student who is starting their own landscaping or design business after graduation have experience writing business plans, speaking to an audience, and connecting their math class to their business interests? And shouldn’t an elementary student interested in everything have the opportunity to explore with their mind and their hands as they make their way through our K-12 system? As a teacher, parent, and student myself I believe we need to expect more out of all of our students, and give them the opportunities in school to do “real” work instead of consistently “preparing” them for what is next. I met Dan for the first time this summer and was immediately impressed by his knowledge and attitude towards teaching and learning. He was a Tech Ed teacher in Upper Perkiomen School District and I was the new administrator. We were on the same interview panel for new teachers and got to know each other quickly. Dan had a wide range of experiences teaching ever level of Tech Ed and Industrial Arts within the district. He had been at the Elementary School, Middle School, and made the switch back to the High School this summer. We got into a discussion during our first meeting about the changing landscape of high school and how the Industrial Arts department and program needed a re-design. By September our idea had transformed into something tangible, as we understood this challenge and gathered research to support our idea (Phase 1). We set out to create a new 9th grade course where students would have the opportunity to learn design and engineering concepts hands on through a variety of creative experiences. We also wanted to create a course that would be gender-neutral in its description and experiences, hopefully bringing the ratio between boys and girls in class closer to 50%. After meeting with the High School Principals, our Assistant to the Superintendent, our area Robotics expert, and the other members of the department we began to put together the pieces of this course to frame the opportunity for our students and school (Phase 2). With the challenge, idea, and opportunity firmly in place, our next steps were meeting with various stakeholders and then going back to the drawing board again and again (Phase 3). We decided this course had to be a funnel for the rest of the department’s offerings. We couldn’t have all the 9th graders take a design and engineering course…only to take traditional “wood shop” courses in 10th-12th grade. We also wanted to make sure we kept the good pieces of our Industrial Arts program instead of throwing everything out. Students will compete in a head to head robotics competition while learning the principles of design, construction, and programming. Students will construct a fully functioning desk clock that demonstrates the creative concepts that go into the building process. Students will be given the task of creating a product for daily use in their life that will be designed in AutoCad and printed using a 3D printer (i.e. iPhone Case). Students will design and create their own personal logo that will be cut on a vinyl plotter and placed on an article of clothing or other graphic product of their choice. In order for students to have these experiences we had to propose the new course to our school board along with the budget requests to make this a possibility. Vex Robotics team set for students to build out their own robots in each class and then create a competition where teams of robots played against each other. 3d Printers from Airwolf. We searched far and wife and felt their line of 3d printers were perfect for our new course and department. 4×8 CNC Router will allow students to design and create professional grade products for our community and school district. Our students will be able to create their own custom products with almost any material. Vinyl Cutter/Plotter which are versatile and allow for a wide variety of finished products that include: shirt logos, magnets, decals, signage and other creative media. Heat Press to be used along with the Vinyl Cutter for our design aspect of the course. We presented our proposal to our school board (Dan, Blake, HS Principal, and myself) and had a good amount of questions about the course and direction we are headed. The following week they unanimously voted for our course approval and budget requests! Our final piece to the equation was hosting an area-wide Maker Faire for our students at the end of the year, and those at other area schools (look out for an invite!). From these experiences we are hoping students find real interest in one or more of these areas and choose to take electives in their 10th-12th grade years. More importantly, we want all 9th graders to have this opportunity, and for their feedback and interests to continue to drive our course creation in the upper grade levels (Phase 5). While I’m extremely excited about getting this course ready to start in the Fall of 2015, I’m just as pumped to use the Design Thinking Process in other areas of our K-12 spectrum. Design Thinking can be used as a framework to tackle many of the tough issues we are facing in education right now. And I believe the same can be said for the “Maker Movement” with our students. The Maker Movement matters to all students, because each deserves the opportunity to take an idea from conception to reality, to fail and experiment along the way, and to feel the sense of accomplishment when they make something original. Regardless of the academic experiences students have had in their life, we are looking for every 9th grade student to have this opportunity and want to see what happens next. I’m so proud of the work the teachers and leaders at Upper Perk have already done, and I cannot wait to see our students making. This course is only one piece of the puzzle, and the same can be said for the entire newly designed department. But as we continue to build these blocks, learning is transformed into a more and more authentic experience for all students. Would love to hear your thoughts about this course, department, and design thinking process in the comments! At March’s Board Workshop meeting, Upper Perkiomen’s Education and Technology Innovation Specialist, A.J. Juliani, presented a vision for innovative learning. The vision, as you can see in this presentation, is tied to the work staff and students have been doing over the year to build a model for sustainable innovation. The Upper Perk Learns Initiative is detailed in this presentation, and will be followed by another presentation at the April Board Workshop. Inside a former Bethlehem Steel research facility atop South Mountain, Lehigh is creating a vibrant and unique learning environment—a space in which students are given the freedom to pursue answers to open-ended questions while working in, and across, all disciplines. In the process, the students are challenged to increase their capacities for independent inquiry, for taking intellectual risks and learning from failures, for collaboration, for recognizing important problems and opportunities to effect constructive and sustainable change. The Mountaintop Program has been written about in the New York Times and Fast Company, but there was no sense of “we are done” from Dr. Alan Snyder and the rest of the Lehigh team. They were actively talking about how the program was growing and improving. Also, what they were learning each summer from the students and mentors working in the program. As we toured the facility there was a sense that the work had only “just begun” and we were watching something special unfold. “I actually believe that the timing of this couldn’t be better,” Lehigh president Dr. Alice Gast told Co.Exist. “This kind of work you can’t do online, you can’t do at night in your pajamas on the computer. You need to be with other people, and it involves collaboration, and the inquiry, and the open-endedness you can’t get from a MOOC—but I think [Mountaintop] is very complementary to those resources,” she added. The Mountaintop facility is old. It’s beat up. It is rusty and probably a bit dangerous. But that is what makes it so special. Students and faculty don’t need to worry about the space. They can use the space however they want. The docks are filled with whiteboards and crates and wood, all can be used for a multitude of purposes. The students make the space their own, and build on it as need be. A lot of times we think of innovation as something fancy and glitzy like a new iPhone. In schools (just like in life) innovation doesn’t have to be pretty, it just needs to support the work. Students work in teams on a product (with a specific purpose). They work together off-line, on-line, and cross-teams. The space is set up so there is a huge communal spot for conversations and gathering in the middle of the dock. The work is important, which leads to engaged conversations, and hard challenges to solve. We often think of innovative work being done by a mad scientist somewhere in a lab by themselves, but this program was about a group effort that was ultimately one of the most rewarding pieces. During the visit Dr. Snyder made it a point to talk about the process. How students chose topics to study and problems to tackle; and why it was messy, but centered on learning by doing. The Mountaintop program is still debating about “grades” for this program. There are no “tests” or other traditional types of assessments. And much of the assessing is work between mentor professors and the students (as well as outside mentors). In many schools are focus is on the end result. Yet, the process (and how we tackle the challenge) is sometimes way more important than a finished product. After our visit to Lehigh we began to discuss plans to expand our Makerspace and xLab into a full blown Innovation Academy. Our vision of an Innovation Academy is very much like a school-within-a-school approach. Rob and the HS administration have already discussed what it would look like to build out career pathways for our students, and seeing the work Lehigh was doing at Mountaintop solidified some of the reasons behind this type of transformation. Right now we are in the planning and building phase of what an Innovation Academy would look like at Upper Perk. Here’s where we need your help. As an avid blogger and believer in student choice, I’ve came across many resources about innovation, inquiry, design-thinking, and maker examples–but we need more. Do you know of any schools that have taken the ideas behind 20% time and Genius Hour and devoted an entire set of classes to this type of innovative work? Please share any resources in the comments (or any thoughts on the program you might have)! 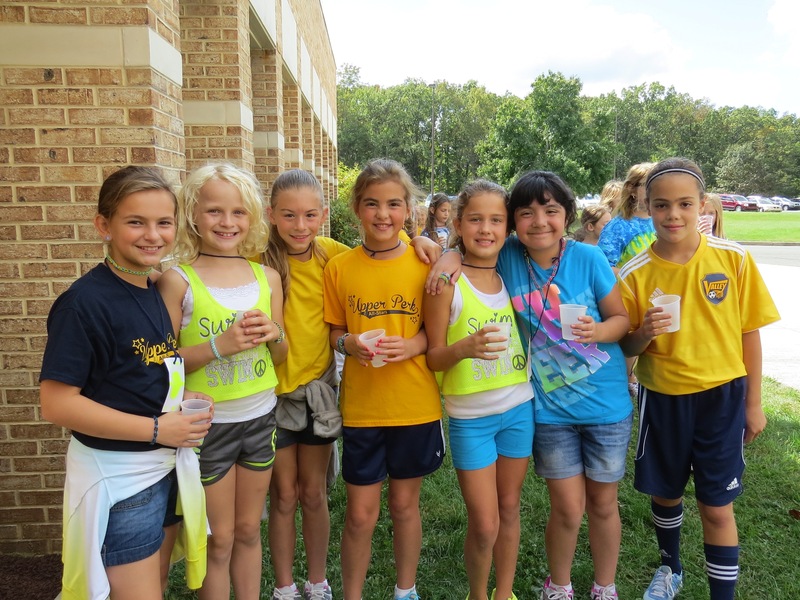 This is a guest post from Allison Stephens, our HS Assistant Principal at Upper Perkiomen SD. It’s so great to see all of our building level administrators on Twitter engaging, but this is an honest post on what it’s like navigating a twitter chat for the first time. Enjoy! So I have been thinking about trying out a twitter chat for some time now. I have been lurking on different hashtags to see which ones peak my interest. Browsing through the monthly NASSP, I came upon #APchat. This chat takes place every Sunday night at 8:00 pm. Perfect! Of course, I had to start by observing from afar. I couldn’t bring myself to jump in with both feet. I lurked on #APchat last weekend. The topic was RtI, which is interesting to me, but not exactly applicable to me at this point in my career as a high school assistant principal. This week the topic was school safety. Score! There isn’t a day that goes by in my position that I don’t think about the safety of each and every student and staff member in the building. We also had a recent incident in the community in which an active shooter was on the loose, thus necessitating a building lock down. The timing of this twitter chat topic couldn’t have been better. One of the reasons why I have never participated in a twitter chat before was because I didn’t think anyone really cared to have a conversation with me. I was wrong. I began to share my ideas on school safety and began to get feedback on my viewpoints. Respect and communication are essential to safe schools. I grabbed some tid bits about how to improve school culture. Actually talk to students and see if they feel safe. What a novel idea. I shared an idea with a fellow educator about creating an anonymous google form in order to discourage the mentality of “snitching”. Really awesome stuff. My son is crying because the light from my cell phone is keeping him awake. I am beginning to panic because I missed answering a few questions, but it’s all well and good because Twitter is cool like that and you can go at your own pace. I can go back and review the questions and answers when he is calm. As fast as it started, it is over and I have ten more followers. I needed to do this not only for myself, but for the staff at my building. I need to share and get feedback and collaborate because that is what I expect students and teachers to do. No matter how busy I am, I need to make time to engage in professional development in order to improve my own practice and support the professionals around me. Meaningful PD, that I chose to engage in, at my own pace, on a Sunday night, all while getting my son back to bed. I might try a Twitter chat again. Thanks for the collaboration and conversation #APchat! What are some other good Twitter chats that I can engage in?